Preheat over to 400 degress. While the ribs are cooking, in a cast iron skillet or roasting pan add tomatoes and onion roast in your oven for 25 minutes. Heat up a skillet to toast the árbol chilies, this takes about 1-minute stirring frequently to prevent burning. Remove from heat once they become fragrant. In your blender add the roasted tomatoes, onions, 2 garlic cloves, chillies, 1 teaspoon of salt and 2 cups of water. Blend until smooth. In a medium sauce pan add nopales with a couple pinches of salt and cover with water. Bring to a boil and cook for 15 minutes or until tender. Remove from water and rinse with cold water. Add the sauce to the pan where the ribs were cooking over high heat, scraping the bottom of the pan with a wooden spoon to pick up the bits and pieces of the pork. Cook for 10 minutes stirring constantly. Add ribs and nopales to the sauce and stir to coat ribs with sauce cook for an additional 15 minutes. Add salt if necessary, serve with tortillas, rice and enjoy! You can find nopales in most Latin grocery stores, farmers market, and some more typical chain markets. 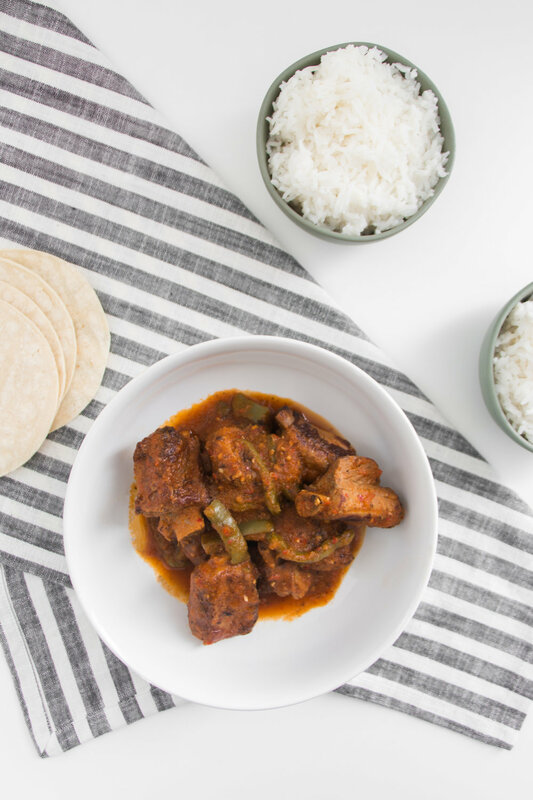 Nopales are definitely optional, this recipe is delicious and can be enjoyed without them.